Start off with a buffet selection of granola, cereals and fruit. 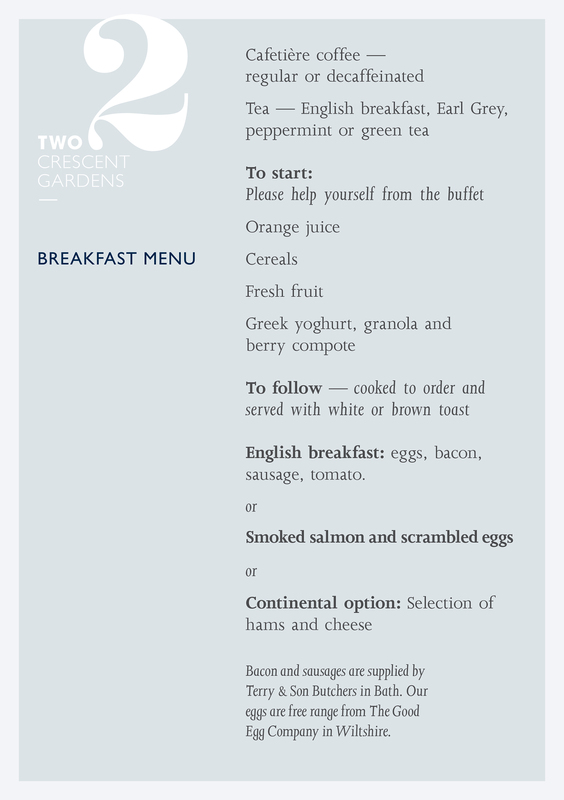 Then choose from one of our scrumptious hot breakfast dishes made to order in our open plan kitchen. Wherever possible we source ingredients locally. For example, our bacon and sausages are supplied by Terry & Son Butchers in Bath and our eggs are free range from The Good Egg Company in Wiltshire. Breakfast is included as standard in the price of your room. Please help yourself from the buffet. Cooked to order and served with white or brown toast. English breakfast: eggs, bacon, sausage, tomato and mushrooms. Continental option: Selection of hams and cheese. Bacon and sausages are supplied by Terry & Son Butchers in Bath. Our eggs are free range from The Good Egg Company in Wiltshire. If you have any allergies or dietary requirements please let us know in advance and we will be pleased to accommodate you.